It’s June. What are we going to talk about with no Town Moor Hoppings in Race Week? As now, this was the issue facing the city 99 years ago when, following a series of disputes between the Freemen, the showmen and the council concerning, among other things, ‘damage to the pasturage’ (Sound familiar? ), the fair left the Town Moor. This year, alternative events ‘with broader appeal’ are planned. 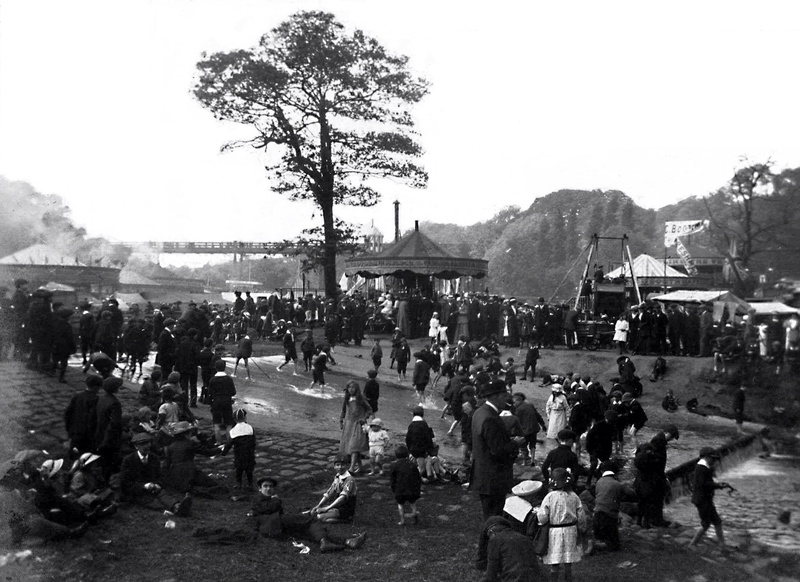 In 1914, the solution was for the Hoppings to relocate to Jesmond Vale and the Ouseburn. As you can imagine, plans to hold it on land known as ‘Green Water Pool’ or ‘The Greenies’, roughly where the Ouseburn Road allotments are now, set off a series of public protests, high court injunctions, rows and letters to the paper. Some people were pleased to see it leave the Moor. ‘West Jesmond’ wrote: ‘It will be a great satisfaction to most people of our city to know that the Freemen have… put an end once and for all to the abuse of the Town Moor during Race Week by the show people and their machinery’. But moving it to Jesmond Vale was far from universally popular. George Lamb of Salisbury Gardens objected to ‘ the Festival with all its attendant noises and ribaldry’. He convened a public meeting, attended by ‘upwards of seven hundred’ and said ‘ no pains will be spared to prevent this projected disturbance of a peaceful community’. The protesters said they didn’t object to the Hoppings at such but believed it should be held in a proper place – and that proper place was the Town Moor’. The protesters also voiced concerns that attempts might be made to make the site a permanent showground, that people who could not afford to pay were being taken advantage of by a greedy, profit making company and ‘by the racket of those unearthly 50 horse power organs and other instruments of torture’. The resolution to oppose the fair was carried, with those voting against claimed to consist ‘largely of youths, who were obviously not residents of the locality’. Another correspondent, ‘Verax’ of Lansdowne Gardens, warned that ‘houses will become vacant’ and ‘the estate will attract a different class of tenant’ not to mention that ‘even if there is a substantial latrine sytem, it cannot entirely be erected without coming into the outlook from some of the bedroom windows’. However John Angus of Jesmond Vale House, on behalf of the trustees of the estate, accused the protesters of nimbyism: ‘You can hold the festival anywhere but not in my neighbourhood’ and pointed out that the field was some 100 yards away from the nearest house and had been used as a ‘free playground for football, golf etc’ by those very ‘inhabitants of the estate’ who were now protesting. He hoped the weather would be favourable for ‘what is really the summer holidays of thousands of poor children whose parents cannot afford to take them further afield’. Mr Lamb replied with new concerns about health and safety: ‘It is damp, the approaches are steep and unsafe, and the stream at the foot is unfenced’. He urged parents to inspect it for themselves before allowing their children to enter such a dangerous place’. However, despite ongoing expressions of doubt as to the suitability of the site, the Town Moor and Parks Committee of Newcastle Corporation decided not to interfere and the Journal commented on ‘the beauty of the scene in its green valley surrounded by wooded banks’ and ‘the green glories of the trees and shrubs’ of Heaton and Armstrong Parks’ which looked down’ on it. Later in the week though when the ‘recent excessive humidity of the atmosphere’ had passed, the newspaper reports emphasised the fun of the fair and by the Thursday, the Westgate Road Picture House was inviting the fair goers to ‘come and see yourself on the pictures ‘ along with Viennese Orchestra, dainty teas and the main show ‘The Sacrifice of Kathleen’ (a fine drama of great heart interest’). Wouldn’t it be great if the reels could be found? Despite the arguments and the weather, the festival remained at Jesmond Vale. It couldn’t return to the Town Moor during World War 1, as troops were trained there and parts of it were used as an airstrip. 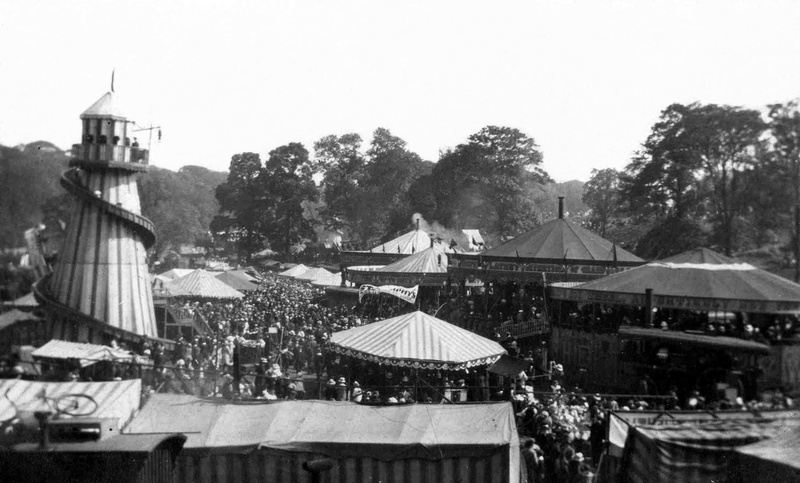 It returned to the Moor in 1919 but again between 1920 and 1923, smaller Hoppings took place at Jesmond Vale. (Source www.newcastle-hoppings.co.uk). The photographs above were taken sometime around 1920 by Edgar Couzens, a local butcher, who had shops in Heaton Road, Chillingham Road and at 185 Shields Road and who lived at various Heaton addresses including Sefton Avenue and Charminster Gardens. The photos were kindly digitised and passed to us by his grandson Mike Couzens. If you have pictures or any further information about the Hoppings during their time by the Ouseburn, we’d love to hear from you. This entry was posted in Research and tagged Armstrong Park, Edgar Couzens, Green Water Pool, Heaton Park, hoppings, Jesmond Vale, Ouseburn on June 13, 2013 by oldheaton.